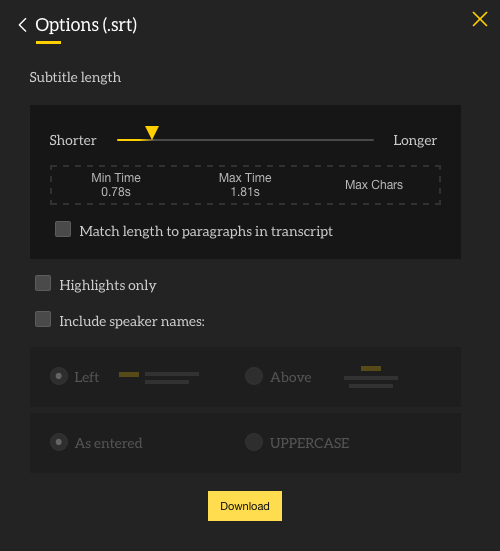 Manually typing captions or subtitles for video in Adobe® Premiere® Pro video files is a thing of the past. 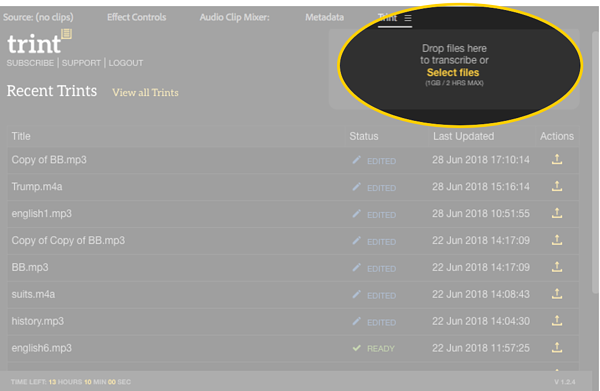 With the free Trint extension, automatically send your audio or video files from Premiere Pro to Trint to be transcribed, then easily add captions (SRT or EDL) to your project in seconds. Let's take a quick look at how to install and use Trint for Adobe® Premiere® Pro. After you've downloaded and installed the Trint extension for Adobe® Premiere® Pro, open the Trint panel (Window > Extensions > Trint). Please note, you must have a Trint account with credit to use the Trint extension. To create a Trint account and get 30 minutes of free transcription, click here. The caption file will be downloaded to your computer. To add the captions/subtitles to your project, locate the file and drag it onto to the project timeline. 5b. EDL If you're using an EDL file, we recommend selecting the default preferences from the popup windows. When the EDL files download, select "File > Import..." then locate them on your computer. 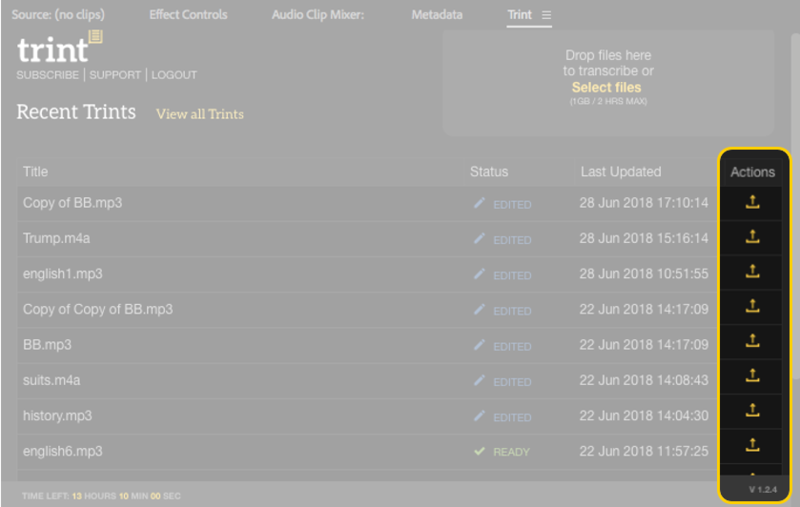 Open the folder from the Project panel, select all the files and select "File > Link media..." The video cuts are displayed with the fully edited/merged file first, followed by each individual clip. 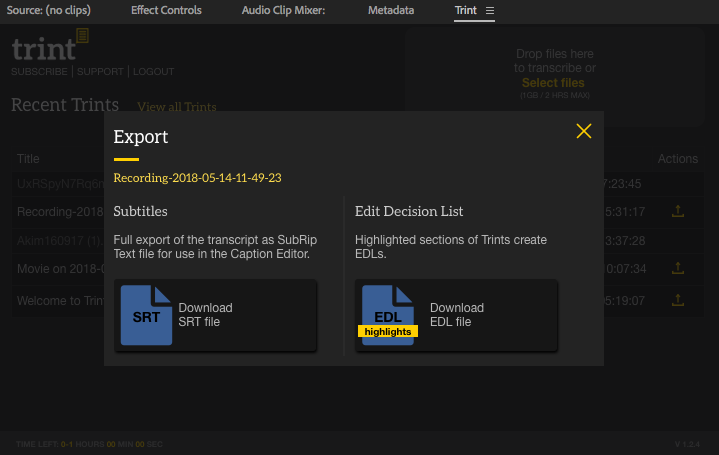 To add the captions to the cut video, download the SRT file from the Trint extension, making sure to check "Highlights only," then import the SRT file, link the media to the original video file, and drag the caption file onto the Project panel to sync.